For more information, please contact Tanya Aho at (313) 331-3469. Amplifying youth engagement and voices in our community. Youth on the Edge of Greatness (YOE) is the Eastside Community Network's oldest program, operating since 1985. The purpose of YOE is to garner youth voice in our community planning process. YOE focuses on community service, community planning skills, and leadership skills. There is also a focus on career and college readiness - highlighting creative jobs - through both vocational and college paths. Job training and workforce development are essential for our youth. 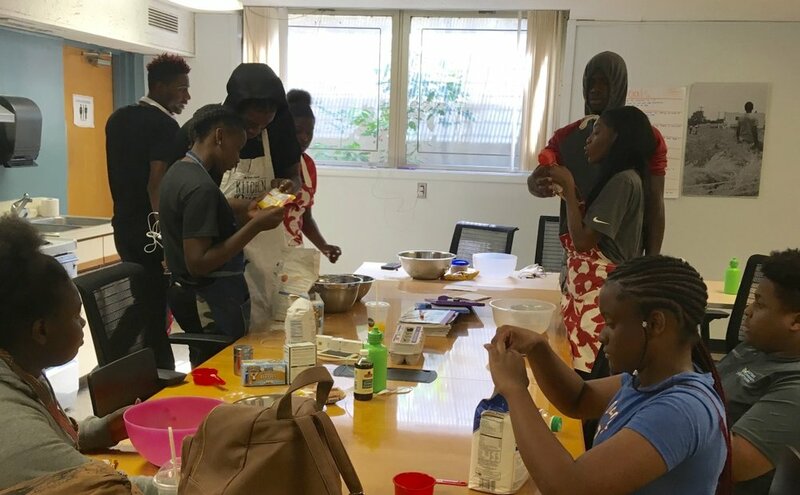 Through strategic partnerships with Grow Detroit's Young Talent and Detroit Wayne Mental Health Authority, we provide summer employment to youth on the Lower Eastside. Over 6 weeks, youth gain job experiences and are trained in job readiness, internet safety, etiquette, team building, and financial literacy. To be a safe, chill-able space where teens are empowered to use their voice to create a positive community that fosters leadership and inspiration. The Vault is guided by our Teen Advisory Council (TAC) - a 12-15 member group that began meeting in October 2016. TAC officers meet once a month to provide feedback and ideas for The Vault programming and activities. These youth are also involved in other ECN led community planning and leadership building activities. On Wednesdays, the Vault teens meet together to cook a meal and have a family-style dinner. During these cooking nights we work on new cooking techniques and teach each our old family favorites. On Monday evenings our teens practice their art skills. During these art classes Artist’s heaven - a volunteer group of artists expose The Vault youth to different types of art and teach our youth new artistic techniques. Our curriculum currently focuses on painting, acting, creative writing, and singing. Eastside Community Network is partnering with Southeastern High School again this school year to host a Community Development Speaker Series for a sophomore class every Friday. Speakers will have conversations with the class about methods of community-building, and help students identify and plan a project to tackle issues in their community that concern them using those methods. Speakers this year will include Barb Martin, SpeakRoc and Edythe Ford.